With Britain’s rainfall, it’s hardly surprising that a shop that sells umbrellas should be so long-lived. 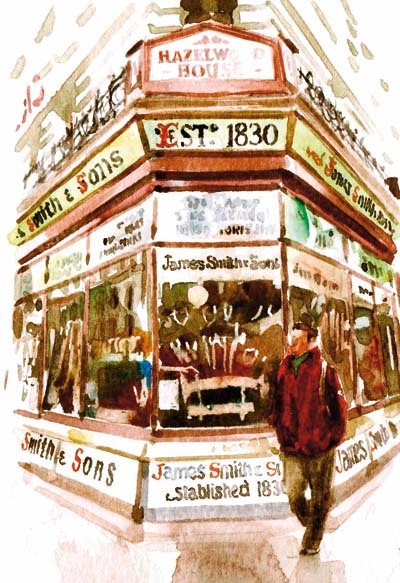 James Smith is housed in a listed building that was built to provide both a store and a factory. It remains largely unchanged since 1857, and, walking round the shop, Arnold Rosen pointed out a sign stating that the store had been established 50 years-gleefully noting that the sign itself is now more than 100 years old. The selection of sticks and canes-many of which are still made on site is extraordinary, and Arnold assures me that Smith’s umbrellas are expected to last at least 20 years (if you don’t leave them in a cab). 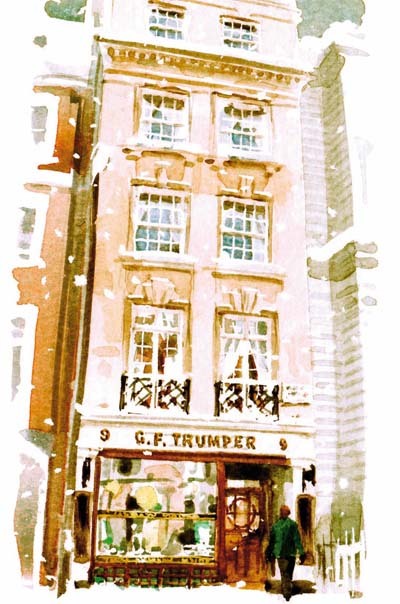 George F. Trumper opened his doors in 1875 to cater for ‘The gentlemen of London’, and on a recent visit, I learned how much ceremony and skill I’d been missing in some 35 years of mundane shaving. From the shop at street level, antique stairs lead down to a collection of individual cubicles furnished with massive, sturdy barber’s chairs, facing tall mirrors and pure white basins, shaving potions standing neatly in lines at the ready. Individual lessons are offered in the use of both safety and cut-throat razors, and make an excellent gift. 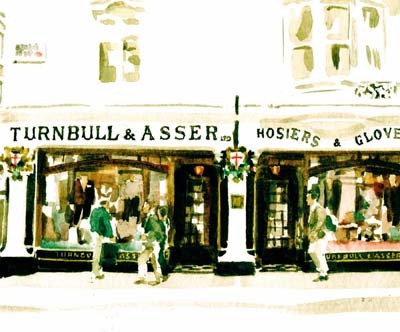 Since it first opened in 1885, Turnbull & Asser has provided shirts to princes, Prime Ministers, film stars and James Bond. In the bespoke shirt department, it’s possible to specify one of more than 1,000 different materials; if you make your way to the lower level, you’ll find a slightly cigar ravaged piece of British and Jermyn Street history. In a glass case is a velvet example of the ‘siren suit’ that Turnbull & Asser produced for Sir Winston Churchill during the war years. The garments were described as practical and comfortable, but Churchill himself referred to his as his ‘romper suit’. A traditional butcher is rare these days-especially in central London-but I don’t think it’s possible to buy better-quality meat in this country than at Allen the butcher. The choice of meat and seasonal game is exceptional, and if you’ve never tried salt marsh lamb, you should beat a path here when it’s in season (June to October). The store first supplied Mayfair tables as far back as 1830, and its traditional layout, with meat hung on the tiled walls of the store around the central chopping blocks, is matched by a quality of service from a more genteel age-all at a price that’s surprisingly acceptable. This compact cafe-pâtisserie opened in Soho in 1871, and is now owned by Michelle Wade, who runs it with her sister Tanya. The cakes, pâtisserie and savouries are made by three chefs in the snug kitchens above the shop; there is a constant bustle as they appear, bearing cooling racks of fresh delicacies that will transport your taste buds to rural France. 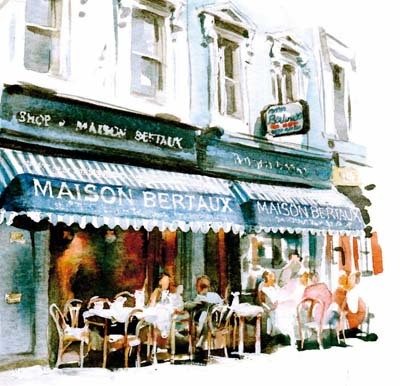 ‘Think of the shop window as our menu,’ says Tanya, as she glides between the tables outside. Pain au chocolat and croissants are highly recommended. 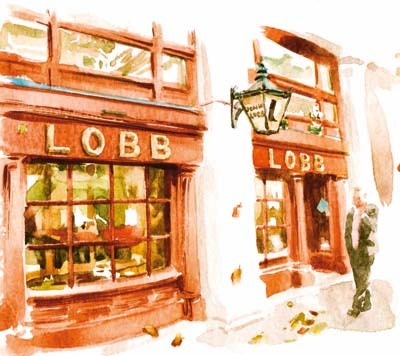 The history and heritage of Lobb the shoe-makers can be measured by the more than 1,000 lasts that are stored in the Harry Potter-like vaults under the store (Best of British, September 23). Surrounded by beautiful antique cabinets full of shoes and historic leather-working tools, Jonathan Lobb, who today runs the business with his brother, explained to me that it takes nine craftsmen to create a pair of handmade shoes. The Prince of Wales recently visited the store wearing a pair that he had worn for 40 years. Once you’ve waited the six to eight months it takes to create your own footwear, you can comfort yourself with the fact that, calculated over their lifetime, 17p a day is great value for a piece of the very finest English craftsmanship. 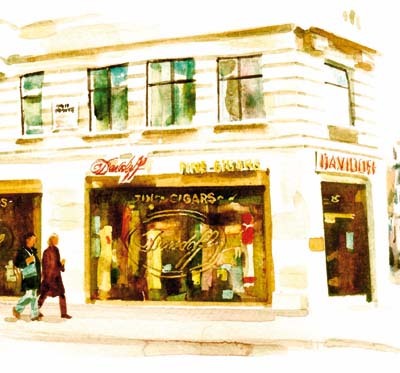 Customer service can mean a call centre somewhere unpronounceable, but London’s cigar-lovers have the real thing in Edward Sahakian, the proprietor of Davidoff. 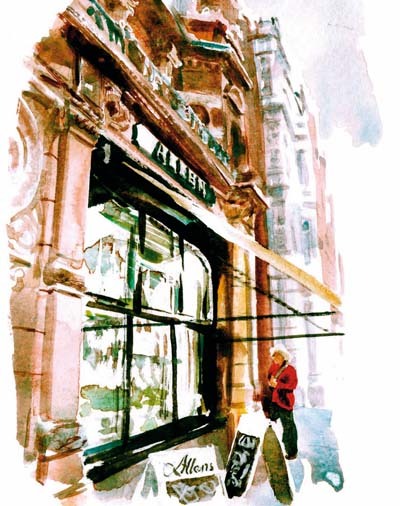 He has been running his elegant store for almost 30 years and his brand of service is unequalled in London. Customers may be surprised to be asked a number of questions before he offers the finest of Havana’s produce. When will you smoke it? What will you have eaten and what will you been drinking? You’ll always be welcome here, whether you buy one cigar or a box of 25, and that’s what keeps us coming back. 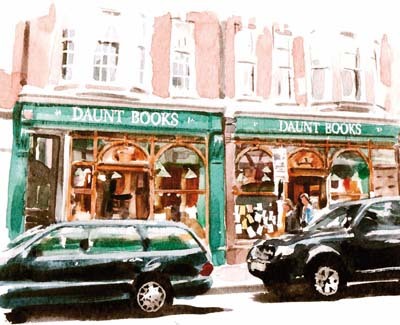 Daunt Books nestles in the middle of the village-like Marylebone High Street and is a fascinating bookshop with friendly and knowledgeable staff. 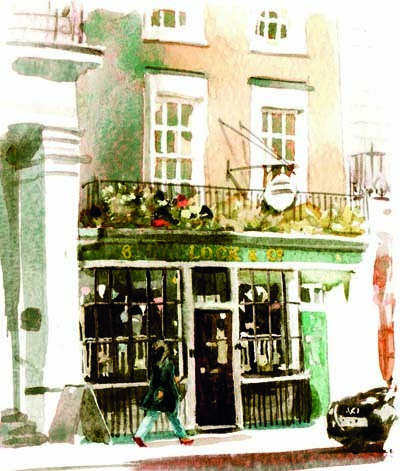 Built to house an antiquarian bookshop in 1910, the shop passed through a number of hands before it became the home of the first Daunt shop in 1998. There are excellent children’s and fiction sections, and I strongly recommend that you sign up for its mailing list, which will keep you updated on the many talks, readings and book launches that are often hosted with a glass of wine. This is probably the store Adam Smith and Napoleon had in mind when they described the British as a nation of shopkeepers; it’s been around since those times. 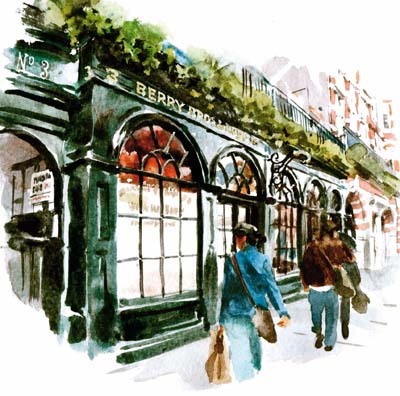 Berry Bros, which was founded in 1698, is one of only eight family businesses in London that are more than 300 years old, and the shop front gives you a hint of the store’s longevity. As you enter, the ancient wooden floor-which tilts at an angle-leads to the enormous scales where coffee used to be weighed. Today, the cellars beneath the store house a wine school and one of the finest entertaining venues in the capital. Lock & Co was founded in 1676. It has been on this site since 1764, and the business is still owned by descendents of its founders-but don’t get the impression that this is a dusty museum. Lock is placed to supply whatever style of headwear you require. To ensure a perfect fit, an extraordinary 150-year-old machine creates a ‘map’ of your head. I visited the workshop four floors up, where three milliners work to produce effervescent creations. Lock can supply you anything from winter hats in July for those heading for colder climates, to a panama in December for Christmas on the beach.